I think this book falls firmly into the category of definitely not for me. While I can objectively see why others like it (and I am sure my sister will go nuts for it when I lend it to her) it didn’t really do much for me, and I don’t see myself continuing with the series. Why did I even pick this book up? I want to say its because the plot sounded interesting, because it does. A centuries old woman who has been raised to serve vampires and feed them her high quality blood must flee to the “real” world when her patron/owner is found murdered. Here she teams up with an exiled and cursed noble vampire to prove her innocence. I mean, it’s not groundbreaking as plots go, but in the rights hands there was a lot of potential there. But even though I want to claim it was the plot that drew me to this book, if I’m being honest I think I have to admit it was the cover. Blacks, greys and muted gold and that shock of bright blood red. Really striking. It’s sensual and gothic and really drew me in. 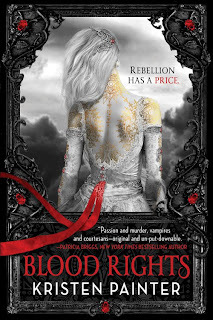 I was imagining a rich, dark tale to match the cover, something like Anne Rice’s early Vampire books, or Lianni Taylor’s more recent ‘Daughter of Smoke and Bone.’ Something stepped in atmosphere and personality. It also feels overwhelmingly American. Which, ok, a solid chunk of it is set in America. But a goodly amount is also set in Europe, and these scenes are no different from the American based ones. I didn’t even realise that the vampire sections of the book were European based until a character explicitly mentions it. And our main character, Chrysabell, has lived her whole life in Europe. Yet she comes across as just another all American heroine. And not just that- she’s grown up with no modern technologies, and yet being suddenly thrust into modern American society doesn’t seem to faze her at all. And lets not forget that she’s supposedly 150 years old, yet acts just like someone in her mid twenties. You can’t just say things are so in a book, you have to actually show them to be so as well! It made the whole book feel bland and shallow. This was my main complaint with the book. The characters are nothing new, especially if you’ve read any other urban fantasy novel before, but they’re not terrible. The overall thin plot is ridiculously stretched out and the “twist” is easy enough to see coming, but again, it’s serviceable. The problem is I’ve never been a huge fan of urban fantasy, and this book (despite what I’d hoped) is pretty much a standard, by the books, example of the genre. Like I said, I’m sure others will really like it- I can even see why. But it definitely wasn’t my cup of tea.